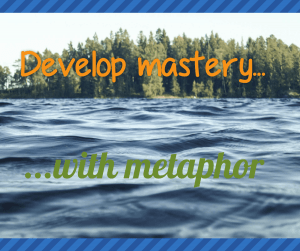 So, how do you develop mastery with Metaphor? There are a couple of great ways to do so. To get it, visit our Free Metaphor Email Course page and sign up there. I figure the best way to convince you that you need it is to give a lot of it away to you. If you find it valuable I hope you’ll get the course. The Practical Guide to Metaphor and Advanced Metaphor is two dynamic CDs (83 minutes and 7 seconds) full of powerful information. Recorded live at an NLP Master Practitioner training, folks paid thousands to hear this material. But you’ll get more metaphor instruction and information than they did! You’ll get additional studio recorded material, PLUS a condensed, laser-focused 33 page workbook of theories, explanations, diagrams and exercises. It’s the most concise, useful and practical collection of metaphor information on the planet! Or, you can just sign up for the email course. There’s plenty of good, solid information there.